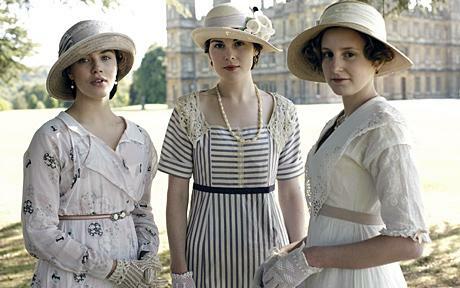 Downton Abbey is an incredible period drama imported to the U.S. via PBS. You heard me, public broadcasting! It has aired two seasons thus far, the first which I caught on Netflix, the second which is currently airing on PBS. But since my local PBS won't air it, I'm catching up by watching online! What is this show that everyone is (or should be!) talking about? The series is set in the fictional Downton Abbey, it follows the lives of the aristocratic Crawley family during the tumultuous 1910s. From the sinking of the Titanic to WWI, to dramas between servants and other scandal, there's just so much going on with this family. If you love period dramas like I do (such as the BBC/Masterpiece serials for Pride & Prejudice, Jane Eyre, and North & South to name a few), then you MUST watch this one. It's like a soap opera, except the production quality is phenomenal and the acting is top-notch. The top three reasons I'm obsessed with this show? READ ON. 1. The Characters. From episode one, you genuinely FEEL these characters. You feel their emotions, their motivations, their flaws. You can't help by yell at the screen when there's evil afoot, or lament the heartbreak and loss. I can't count the number of times I've gasped with surprise, and every episode feels like a cliffhanger. I can't think of another television series that I instantly loved as much. I love Dowager Countess Violet, maid Annie, valet Mr. Bates, Mrs. Hughes, and dear Mr. Carson. I want to love Mary (and her love triangles with Matthew are heart-wrenching! ), but she makes it difficult. Edith is the Jan Brady of the three sisters; you want to feel sorry for her, but she is just too bitter. Sybil is the free spirit, the quintessential youngest daughter. And I want bad things to happen to Thomas. But I can't get into every character... you must watch and form your own opinions! 2. The Fashion. If you loved what Kate Winslet wore in Titanic, you will DIE for the dresses in this show. I love most of what Lady Mary wears. I seriously want to reproduce the dresses, but they have such waifish figures I could never pull it off. But the hats and hair are great as well! Usually I'm in love with Jane Austen-era period clothing, as well as the 1950s, but now I might get started on early 20th century! 3. Maggie Smith. The Dame is brilliant, as always. (Hel-LO Professor McGonagall!) This lady has some of the best moments and lines in the show as the matriarch Dowager Countess. She is sharp and powerful and awesome. Favorite quote? "I'm a lady, I can be as contrary as I choose." I especially love her rivalry with Matthew's mother, the increasingly annoying cousin Isobel. P.S. I took the Which Downton Abbey character are you? quiz and the results are in: I'm Lady Mary Crawley. Figures... Eldest sister, headstrong, and flawed.